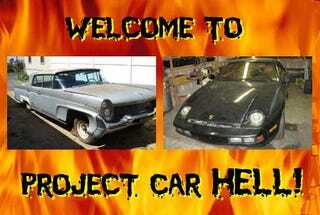 Project Car Hell: Porsche 928 or '58 Lincoln Continental? What with all the racin' madness lately, I haven't had a chance to descend into the lake of burning 90-weight that is Project Car Hell for a few days. In our last matchup, we almost had an upset for the ages, with a Japanese car nearly beating a French car in the Dangel Peugeot Wagon versus V8 Fairlady poll. And that Peugeot was a tough one, too! You fans of Japanese Car Hell can feel proud... or ashamed, depending on how you look at it. Today we're getting away from the PCH Superpowers and mixing it up a bit, with a perennial German Choose Your Eternity favorite going up against a proud Detroit native. We had a 928 here just a couple weeks ago, but the cool/hell equation is just irresistible with Porsche's front-engine V8 machine. It's fast, good-looking, sold for vast sums when new, and has a scary-sleazeball Tony Montana aura you just can't deny... and you can find them dirt cheap nowadays. Well, dirt cheap provided you're willing to fix everything a few things. How about a genuine Porsche 928 for just 600 bucks? Come check out this '82 in Connecticut, which is priced down in 24 Hours of LeMons territory. Come on, you know you can sell off more than a hundred bucks worth of stuff from this car, and you've got 3 months to go before the New England race! Or perhaps you want to make it a daily driver and sell cocaine commute to work with it. Either way, you'll need to do something about the transmission, because the seller describes it as "dodgy." We're assuming that means "inert hunk of leaky metal," but maybe it still sort of works! The color is "obviously black," which should count for something, and the engine starts. It also "smokes and is missing," which hand-wringers might interpret as cause for concern... but not you! You'll have that thing purring in no time- it's probably just the spark plugs, right? Yeah, can't argue with the coolness of the 928, but how about if you're looking for something with a little more presence? You want a big classic Detroit luxomobile, but you'd rather take the bus than drive yet another Cadillac? We hear you brother (or sister), and we've got the solution: This 1958 Lincoln Continental, which could darken your garage for a mere grand. Now, you could probably sell off $500 worth of parts from this vessel and qualify for LeMons on the money front, but (fortunately for the other racers) this thing tips the scales well beyond the 4,000 pound shipping-weight limit called for in the rules. That's OK, because a car like this should be glamorous, with a gleaming paint job (or ominous black primer, which is also glamorous in our book) and spiffy snakeskin interior. Before you can get to the body, paint, and interior work (of which there'll be plenty), however, you'll need to deal with the running gear. The engine and transmission are out of the car, and that's usually not an indicator that they'll be in perfect working order. You get "all parts plus lots of extra parts and lots of extra chrome," which is a good thing as it's no picnic finding body and trim parts for late-50s Lincolns. At least the engine is the good ol' MEL 430, which is just common enough to make you think you should have no problem finding parts for it. Thanks to Brian B for the tip; Brian has sent in three separate tips and now gets a shirt plus an extra half credit towards...uh... additional PCH Tipster glory!